Cursors have traditionally been a big mess in Linux. The X11 cursor font has been passed down to us from times immemorial, and given us gems such as gumby ( ) or trek ( ). Unfortunately for us, this state of affairs was frozen into the GDK api with the GdkCursorType enumeration and the gdk_cursor_new() function. Since there is no official list of recommended cursor names, cursor themes frequently provide all the variants of cursor names that have been spotted in the wild. 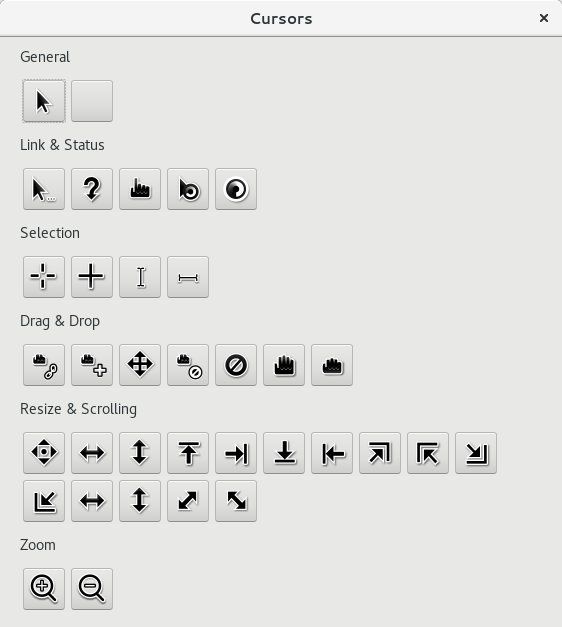 As an example, here is the list of cursors included in the oxygen cursor theme. If you are wondering, the hex strings in this list are a clever trick of Xcursor to retrofit themed cursors underneath core X11 applications that use cursors from the cursor font mentioned above. About a year ago, we decided to finally improve the GTK+ cursor story. Thankfully, the CSS3 spec contains a decent list of cursor names that can be reasonably expected to be available across platforms. Since the GdkCursorType enumeration contains too much nonsense and is not easily extensible, we decided to make gdk_cursor_new_from_name() the recommended API for obtaining cursors. The documentation for this function now lists the CSS cursor names (follow the link above to see it), and the cursor handling code in the various GDK backends tries hard to give you meaningful cursors for all of these names. On some platforms (such as X11 with a random cursor theme), we may have to fall back to the default arrow cursor if a certain cursor is not present in the theme. As part of this general overhaul of the cursor code, the Windows backend grew support for cursor themes. GTK+ itself is now using gdk_cursor_new_from_name() exclusively, with the standard cursor names. And gtk3-demo includes a demo that shows all the standard cursors and lets you try them out. The screenshot above shows it. The changes described here went into GTK+ 3.18, which was released about 9 months ago. Most likely, you don’t have to do anything! 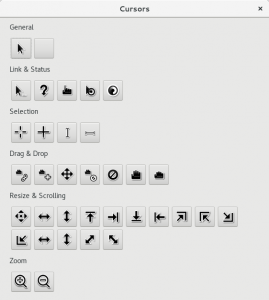 GTK+ widgets use suitable cursors all by themselves, and you can benefit from that without any extra work. If your application is creating its own cursors for whatever reason, you should check carefully if one of the standard cursors shown above is suitable for you. Using a standard cursor ensures that you will get a suitable cursor regardless of the platform your application is running on and regardless of the cursor theme the user has chosen. Please use gdk_cursor_new_from_name() to generate your themed cursor, since this is now the preferred API for this task. Thanks so much for this information. Hope to see more. Nice API and all, also used that recently for Pitivi, but the open hand cursor is not built correctly in adwaita-icon-theme (former gnome-icon-theme). The bug above is reproducible in gtk-demo, try clicking on the open hand, it will show you the finger. @Lubosz: Thanks for pointing that out; the bug has now been fixed in the Adwaita icon theme.